It would not be wrong to say that India loves wheat. From our rotis to our cookies and pastas, wheat rules our kitchen and plates and more often than not in cheap refined forms. According to food writer, Sangeeta Khanna, this fixation with wheat grew post industrial revolution, and we have come to a point that the wheat produce actually exceeds the actual demand. India is rich with several types of flours like ragi, jowar, buckwheat and amaranth. In several parts of the country, these flours can give wheat a good run for its money in terms of popularity. Ragi is quite a show-stealer in the southern part of the country, particularly Karnataka, where it is used to create a number of dishes. Ragi is a rich source of good carbohydrates; it is gluten-free and highly suitable for those who are gluten intolerant; moreover, it is packed with several essential amino acids. Ragi flour is one of the best non-dairy sources of calcium. It also has a low glycaemic index, meaning ragi flour lessens food cravings and maintains the digestive pace, thereby keeping the blood sugar levels in range. 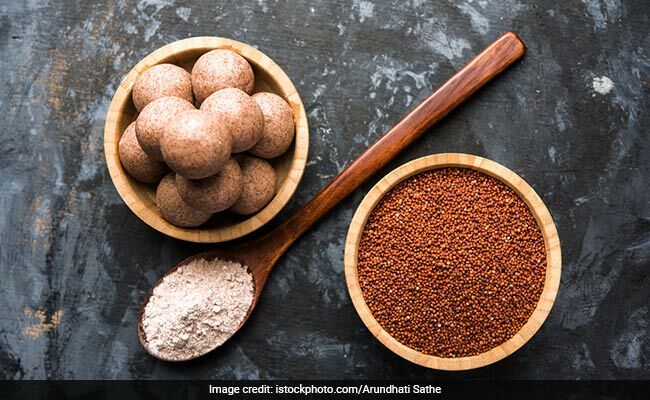 Did you know ragi can do wonders for weight loss too? Ragi for Weight Loss: How Does Ragi Help In Weight Loss? The high amount of dietary fibre combine keeps the stomach full for a longer and prevents unwanted cravings. This in turn leads to a minimised appetite and weight loss. Ragi flour lowers your blood sugar levels in the body by activating insulin. A good insulin activity is said to be linked with preventing weight gain. It is a good idea to roast some ragi before using it, which gives it a great nutty flavour. You can use it to make your rotis and dosas and even mix it with other flours (atta and maida) to make a number of dishes. When you cook with ragi, try pairing it with something light and refreshing, since the flour itself is dense because of all the fibres it contain.